I had a 2008 MacBook Pro. 15 inches. It was a great machine. Until it started to glitch. Like, the screen would malfunction and the machine would Kernel Panic. About twice an hour. It’s really difficult to design anything when your computer previews all whites as blues. Ugh. So my new computer is like a sunny day after a year of terrible weather. Yes. I am that cheap. I waited an entire year and lost lots of work in the process. But that’s all over now and I can see clearly now the rain is gone! And a new computer calls for a new desktop background. Duh! 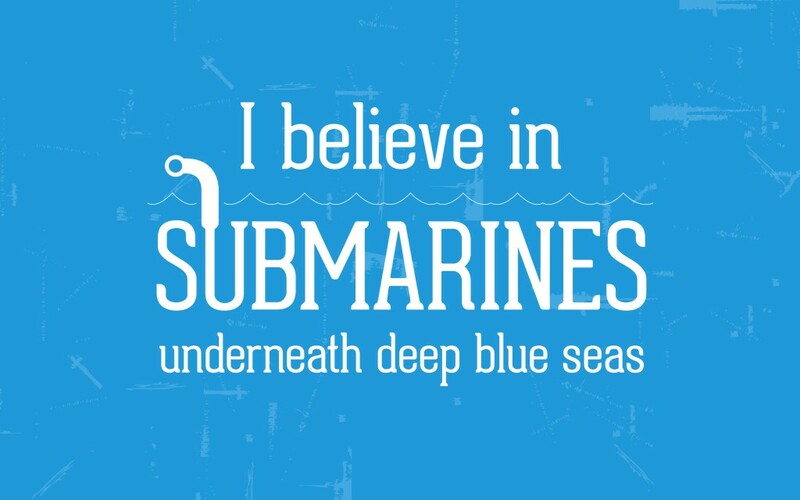 This desktop background (obviously) features the Submarines design I posted earlier. It is another free download and is 2880 pixels wide by 1800 pixels tall – enjoy!